Have you ever had an awesome outfit ready to go, but felt that it was missing something? I recently went through my wardrobe and felt it was missing something, a bit of je ne sais quoi. My keen fashion senses quickly realized that the lack of appropriate accessory was the issue. Then like sunlight piercing the parting clouds, I realized I was missing a lacy crochet bracelet. No doubt my subconscious was looking for a reason to crochet, but I was able to visualize what I wanted and before I knew it, my hands were busy making these beautifully lacy squares. Once I was happy with my squares, I blocked them to ensure they would keep their shape longer. If you aren’t familiar with blocking, I strongly suggest you read this helpful post from Annie’s Catalog as the technique will make your yarn work come out looking symmetrical and professional. Once the blocking was finished, I had the building blocks for the bracelet. With my sewing tackle box handy, I was limited only by the amount of time I had to try out different configurations to get the perfect bracelet. 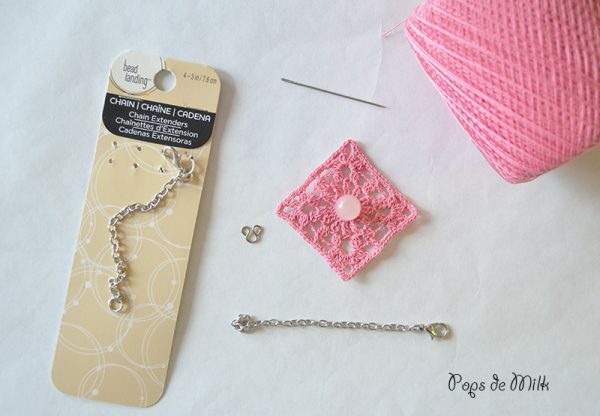 Using only one square, I sewed a pink bead in the centre and used a chain extender from Michaels as the strap. If you are using chain extenders make sure they actually fit around your wrist – the ones I used are 3″ in length. 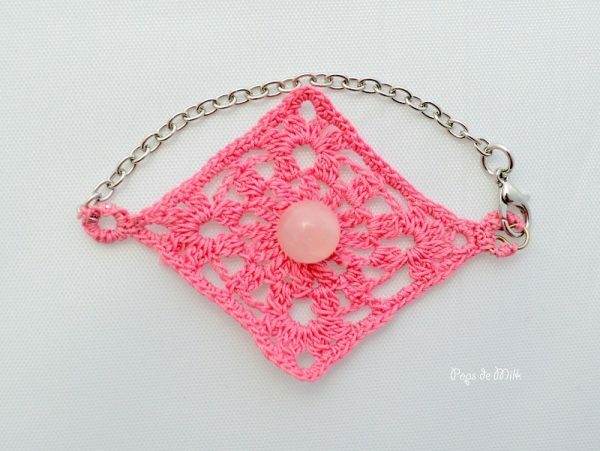 For this project you can use any crochet square pattern you like and if you do a Google search for crochet square motifs you’ll find a gazillion designs. 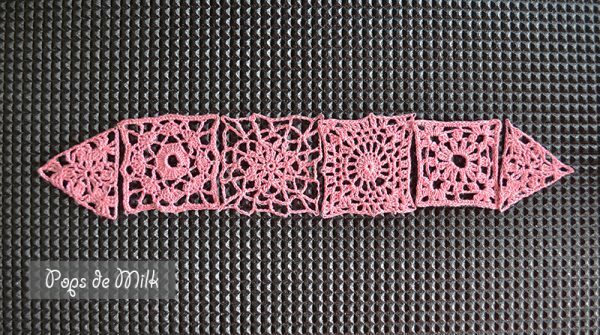 The pattern I used for the bracelet I made comes from the book 500 Crochet Stitches: The Ultimate Crochet Stitch Bible. This book is loaded with variations for stitches, motifs, edgings, and trims. For the thread I used size 30 crochet thread and a size 1.0 mm crochet hook. I really like the way this turned out. It was simple, fun, and crafty. And the best part is feeling stylish and confident while wearing my work on my wrist.